Are there any GM ingredients in the Allinson products? No, Allinson flour and yeast do not contain any GM ingredients. Are Allinson baking ingredients suitable for vegetarians? Yes, all our flour and yeast products are suitable for vegetarians. Does Allinson produce gluten free flour? At the moment, all our flour range contains gluten so is not suitable for people requiring a gluten free diet. Are any of the Allinson baking ingredients gluten free? The Easy Bake Yeast and the Dried Active Yeast are all gluten free. Do any of the Allinson baking ingredients contain dairy products? No, Allinson flour and yeast do not contain dairy products. Are any of the Allinson flours bleached? None of the flours produced by Allinson are bleached. The bleaching of flour was prohibited in 1997. What is the difference between white flour, brown flour and wholemeal flour? Extraction is the percentage of whole cleaned wheat grain that is present in the milled flour. White flour (of approximately 70-75% extraction) is high in starch, and is produced by removing the bran and germ during the milling process. Allinson Strong White Bread Flour has a high gluten content which makes it particularly suitable for bread making. Brown flour is of approximately 90% extraction, which means that practically the whole grain is used in its production, apart from the 10% that is the bran. The resulting flour is finer than wholemeal, producing loaves with a lighter texture, and a full, nutty taste. Allinson Wholemeal flours contain 100% of the wheat grain, retaining all the natural nutrients. They contain significant amounts of fibre, iron and B vitamins. Iron and the B vitamins thiamin and niacin, together with calcium, are added to white and brown flours, to replace nutrients removed during the milling process. Why should I use wholemeal flour? Is it considered to be a healthier option? Wholemeal flour contains the whole wheat grain, so it contains more B vitamins and has a higher fibre content than white flour. It is therefore considered the healthier option. However, all types of flour and bread are considered to make a valuable contribution to the daily diet because they are composed largely of starch, a complex carbohydrate which is an excellent source of energy. Should I sift my flour before I use it? All Allinson flours are sifted at the mill but once it has been packed, the flour sometimes settles in the bag during storage. Some recipes suggest sifting and even though it's not absolutely necessary, it won't do the flour any harm. Obviously by sifting wholemeal flour you take out all the bran and thus the goodness. So if you do sift it, we recommend you mix the bran back into the flour afterwards. Why is the protein content of bread making flour so important? The protein content of a flour is the primary factor in determining what use it is best suited to. Flour with a high protein content will have a high gluten content making it particularly suitable for bread making. 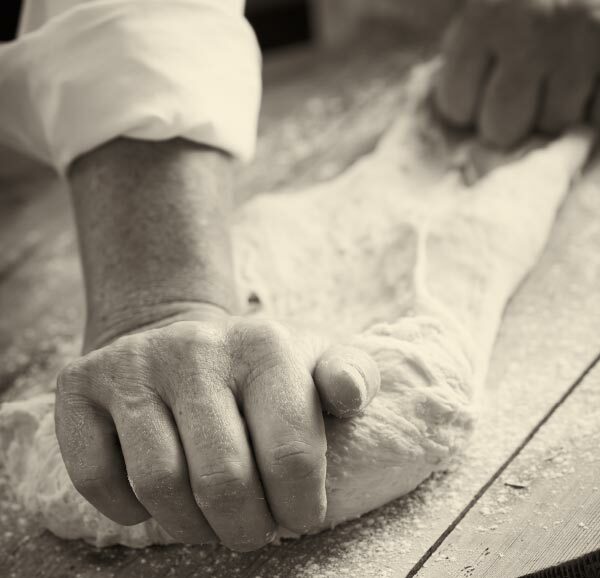 When the flour is mixed with water and kneaded, the resultant dough becomes very elastic in nature. As the dough ferments, carbon dioxide is produced and trapped in the dough by the gluten strands, causing it to rise. During baking, the gluten sets around the bubbles giving the bread a light, open texture. What type of flour is recommended for use in a bread making machine? All Allinson Bread Flours will work well in bread machines. The high gluten content will ensure good results because the resultant dough is better able to withstand the kneading process. How can I make wholemeal dough rise higher? What's happened to Allinson Bakers' Grade flours? We've just changed the name to Allinson Premium flours as we did a bit of research and some bakers didn't really understand what the old name meant. Don't worry it's still the same great flour! What is the difference between Dried Active Yeast and Easy Bake Yeast? Dried Active Yeast is simply compressed yeast from which the moisture has been removed. It must therefore be activated with water before use. Dried Active Yeast is the yeast often preferred in traditional home baking methods. Easy Bake Yeast is a combination of dried yeast and the flour treatment agent, Ascorbic Acid (Vitamin C). The way it is formulated means that it is quicker and easier to use than other types of yeast. What does the term 'proving' mean? Once the dough is kneaded, it needs to prove. This is when it is left to rise until the dough has doubled in size. It rises because as yeast grows, it produces carbon dioxide, making the dough expand. What is the E number in the Easy Bake Yeast? E491 (Sorbitan Monostearate) is a rehydrating agent and an emulsifier. This has always been used in Easy Bake Yeast, but due to regulation changes, we were advised to declare this ingredient on the pack. E491 can originate from both animal and non-animal sources, but we have ensured that ours is strictly non-animal, does not include egg or milk products and is nut free. As such, we display the vegetarian symbol on our packs to indicate this. What does salt do to yeast? Using salt in a recipe is important since it will prevent the yeast from growing out of control; it also improves the flavour of the final product. However, too much salt will retard the action of the yeast and it is therefore important that when mixing the ingredients together the flour is used to create a buffer zone between the salt and the yeast. How do I use yeast? A general rule, 30g of fresh yeast is equivalent to a sachet of our 15g Dried Active Yeast, or 7g of Easy Bake Yeast. Dried active yeast needs to be activated in water. To balance your recipe out, you’ll need to deduct the amount of liquid required in the recipe from the amount of water your have already used to activate the yeast. Why doesn't my dough rise? Is the yeast out of date? Or maybe it has been open for too long? The dough may be too stiff. The water may not have been warm enough to activate the yeast. The rising place may be too cool. Too much sugar and/or salt can kill the yeast. Why does my dough rise but then fall back in the oven? This suggests that the dough became too light during preparation and consequently rose too much. If it collapses in the middle only, this indicates that the mixture contained too much liquid. Why is the top of my loaf always cracked? This suggests that the dough mixture may not have been sufficiently mixed, or perhaps that the dough was too stiff. Alternatively, the bread may have been cooled too quickly. Why does my baked loaf crumble so easily? Inadequate mixing of the ingredients. Too much flour added during preparation. The loaf was left to rise for too long, or left to rise in an environment that was too warm. The oven may not be hot enough. Why doesn't my bread brown evenly on both sides? The bread tins should be placed centrally in the oven to ensure even browning. If the tins are not placed centrally or if they are placed too close together then uneven browning may occur. You should also be aware that very shiny tins reflect heat away from the sides of the loaf. Why does my bread smell of yeast and have a sour taste? This can happen when the rising period is too long and/or the rising place too warm. My bread is dry inside and has a coarse grain, why is this? This can happen when too much flour is added to the dough, or if the dough was not kneaded for long enough. This could also happen if the rising period was too long and the oven temperature too low. Why is my bread wet inside and yet still has a coarse grain? This happens when the rising period is too short. Why is the crust too thick? The oven temperature may have been too low. Too much flour may have been used. The rising period may have been too short. How can I prevent my bread from becoming doughy at the bottom? This problem can be prevented by ensuring that the bread is removed from the tin during cooling and placed on a wire rack. Why has the top of my bread caved in? This is often caused by adding too much liquid to the mixture, which will make the bread rise too quickly. The proportion of gluten will be insufficient to support it. Why is my bread incorrectly shaped? The most likely cause of a poorly shaped loaf is a lack of moisture in the dough whilst it was being kneaded. Do not be afraid to open up your bread machine during any stage of the cycle prior to the rising and baking cycles in order to add extra liquid to the mixture. Why is the dough sometimes sticky, or why on occasions does the dough become too dry and crumbly? If the dough is too sticky, try to add more flour to dry it out. On the other hand, if it is too dry gradually add some extra liquid to the mixture. Why do the added ingredients become mushy, or why do they not mix in properly? You must add these ingredients into the mixture at the correct moment. If you add them too soon, they will be mashed during the kneading process. If you add them too late they will not be mixed in thoroughly. The best time to add these extras would be just prior to the end of the second kneading cycle. Is it necessary to add the ingredients to the pan at room temperature, or can I add them directly from the refrigerator? It is recommended that you add the ingredients at room temperature as this is particularly important for the yeast. However, since the bread machine will warm up very quickly this will help to warm any ingredients that you may have added directly from the fridge.